Since I've done the how-to on purge and declutter steps before I thought I'd just link them up. I started with my bathrooms since I knew they'd be pretty easy, I threw away a few things past their prime and made note of a few things I'd like to "containerize" in week 3. My guest bathroom has 3 tall built-in cabinets, similar to medicine cabinets, but rather tall. That is the only storage in that room and one of those cabinets is our toilet paper storage (they are exactly 1 roll deep), so I only had 2 cabinets to sort through. I relocated a few things that had collected in there, but there wasn't much purging to be done. I'll keep a running list of things I need to either relocate from other areas of the house or purchase for my organizing week, as I go through the rooms purging I'll make note of anything that can be relocated. How did your bathroom purge go? 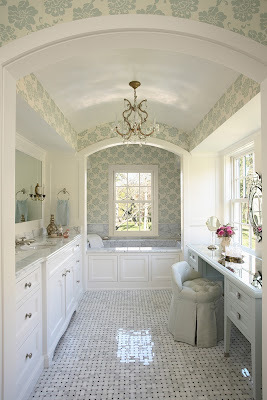 Just a little eye candy, my inspiration photograph for my master bath.